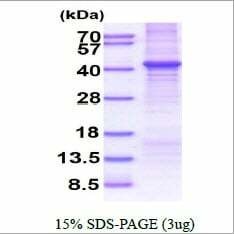 Small volumes of CNTFR recombinant protein vial(s) may occasionally become entrapped in the seal of the product vial during shipment and storage. If necessary, briefly centrifuge the vial on a tabletop centrifuge to dislodge any liquid in the container`s cap. Certain products may require to ship with dry ice and additional dry ice fee may apply. NCBI/Uniprot data below describe general gene information for CNTFR. It may not necessarily be applicable to this product. Binds to CNTF. The alpha subunit provides the receptor specificity. 1. The family-based study showed no association between the CNTFR rs7036351, NET rs3785143 polymorphisms, and attention-deficit hyperactivity disorder.